This looks like milk cartons but they are wine. 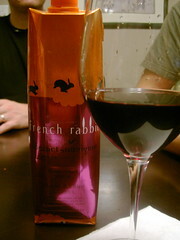 Normal wine carries 750 ml but this one is 1 liter (2 more extra glasses of wine, good news for boozers). This wine is very compact and light. It weighs 90% less than bottles. According to the wine company, this compactness of packaging reduces the numbers of trucks used in production, transportation and recycling. It would take over 25 trucks filled with bottles equals to one truck of this compact package. The package is also recyclable. I tried Merlot (right) $12.99 and Cabernet Sauvignon(left) $19.99 this time. Of course, the more expensive one was more delicious. 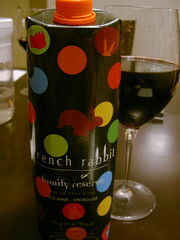 This wine is produced in the Southern France and they have white wines like Chardonnay and Pinot Noir. I would like to try them next time. 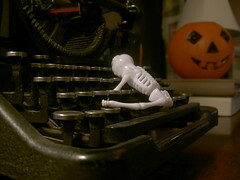 This is the ghost writer which I saw at Mr. & Mrs. K’s residence. can write a great haiku. It’s scary and melancholic. Oh I see! These famous books were orginally written by the gohst writer with the scary titles eh? 例：夫：I bought Rabbit for tonight, whoo hoo!